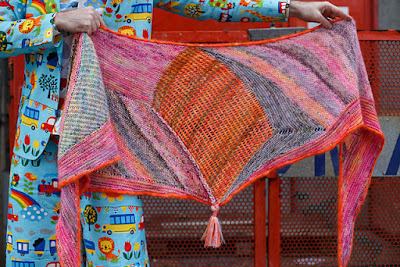 Stephen West is a knitting god. Ok, that goes without saying. And over the past few years, I've knit a few of them. 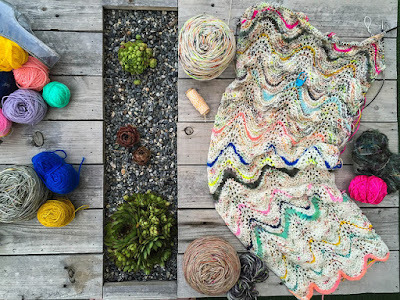 And dream knit a few more. That Exploration Station on the right is one I am particularly proud of. I hand spun that bad boy. 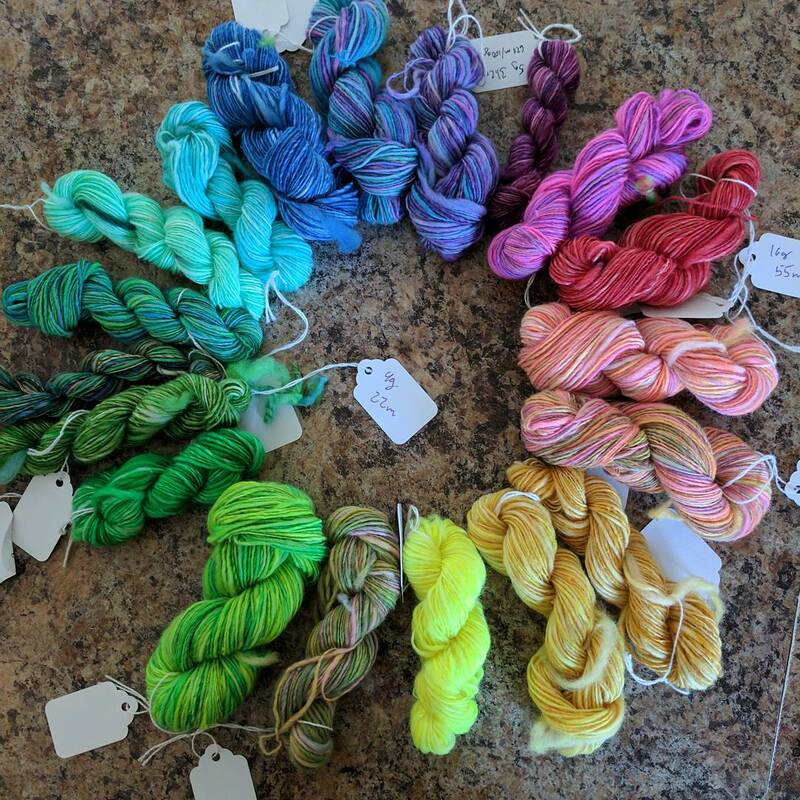 And sure I dyed the yarn in shades that more resemble hubba bubba bubble gum than anything else, but I still love it in all it's squishy goodness. That's why when Stephen announced his spring mystery knit along, I knew I wanted to spin for this project. (Plus I had literally just finished my Building Blocks shawl, and I didn't have the time or stamina to keep up with a mystery knit. Planning to spin for it gave me a good excuse to wait until after). When I found out it was going to be a marled project, I had a good idea of what I wanted to do. The concept was clear, I would spin singles, hold them double while I knit and let them do the colour changing magic for me! 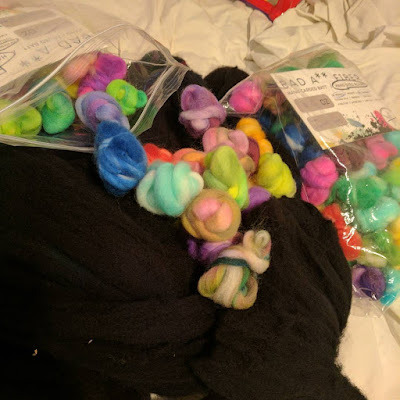 And right away I had an idea of what kind of fibre I wanted to spin. These are Odd Balls, by Stitch Together Studio. Although when I bought two bags of them, they were called scatter bits. 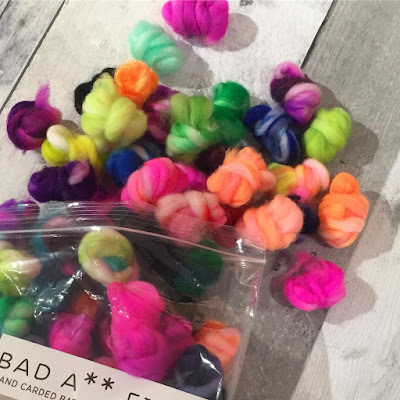 And they are fabulous little 1-2g balls of merino pencil roving in hand dyed goodness. 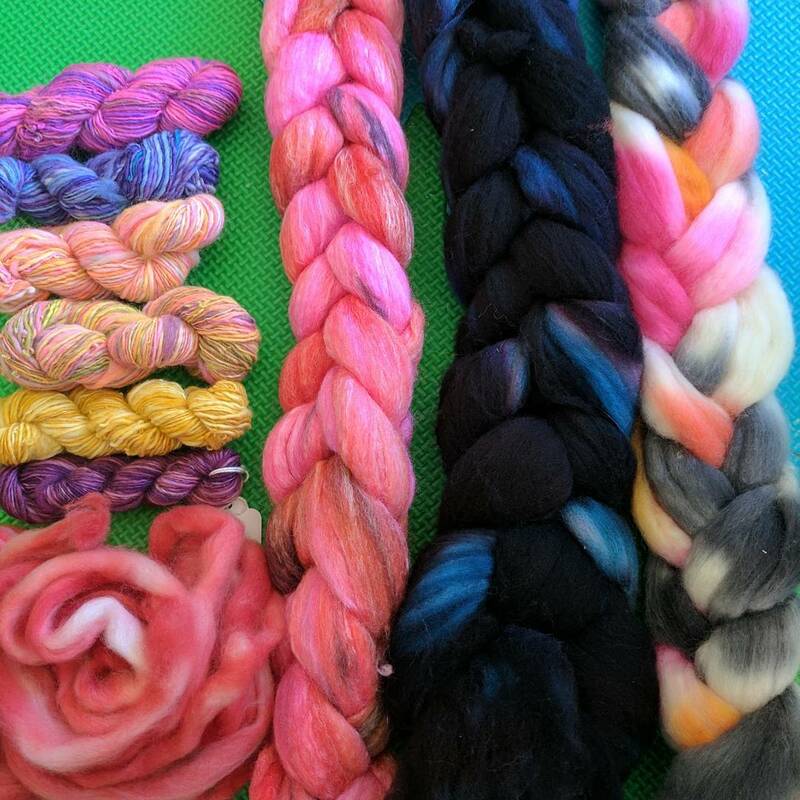 I dyed up some merino roving that I had in my stash in a solid black and thought I would be set..... more or less. 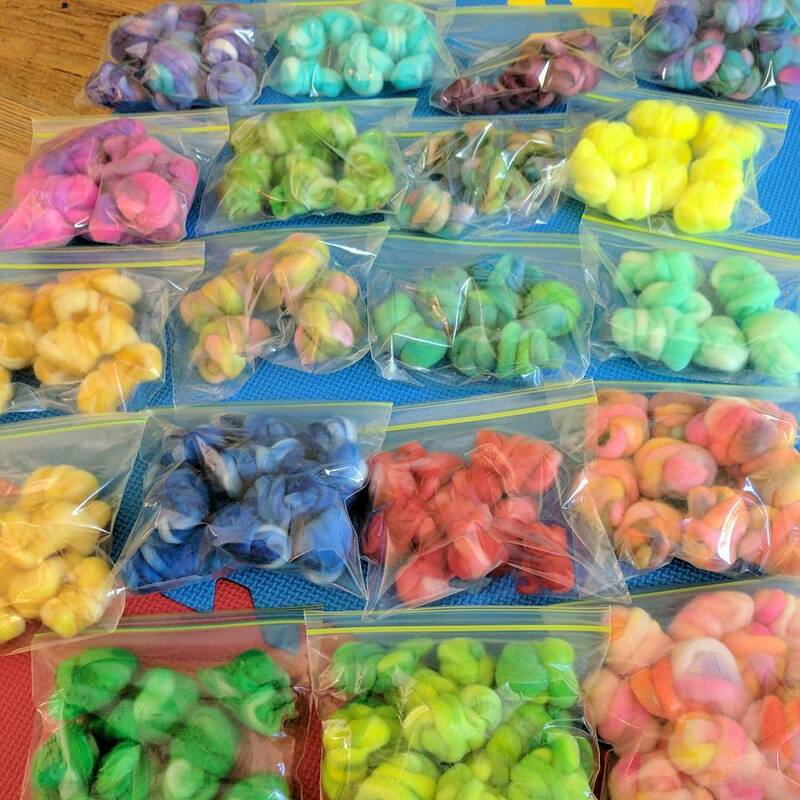 And rather than spin them randomly, I separated them out according to colour. You can see more of my thought process for this project in this Tour de Fleece video. 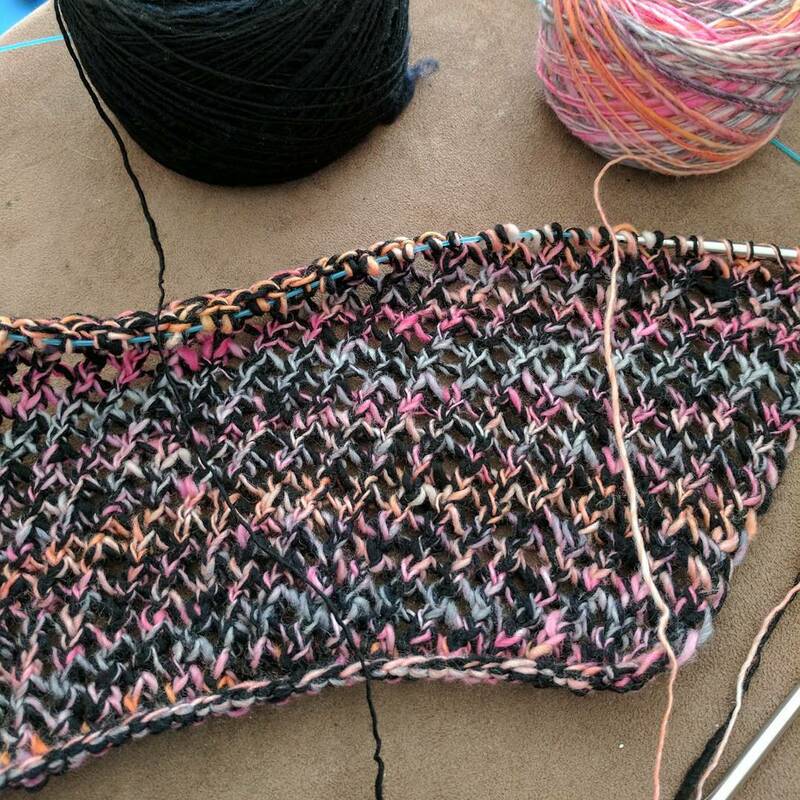 But when I was at Olds Fibre Week, I got it in my head I would need at least one more braid to combine into this project. And picked up one by Flock Fibre Studios in their Princess Tiger Cub colourway. Here it is marled with the black on the first section of the shawl. It was at this point I decided I needed more. 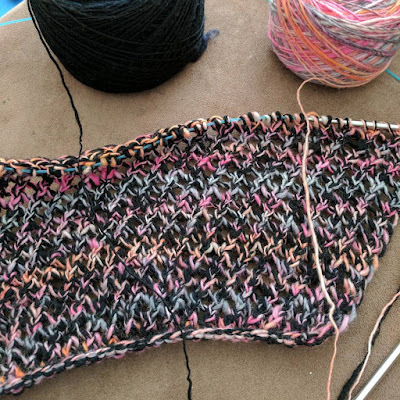 Luckily I was headed into the Stash reopening this past weekend, and while I was there I found the perfect Tin Roof Fibre Studio braid, and settled on my final palette. While I spun up all of my minis, I decided to only work with the Purple through Yellow section of the colour wheel they made up. 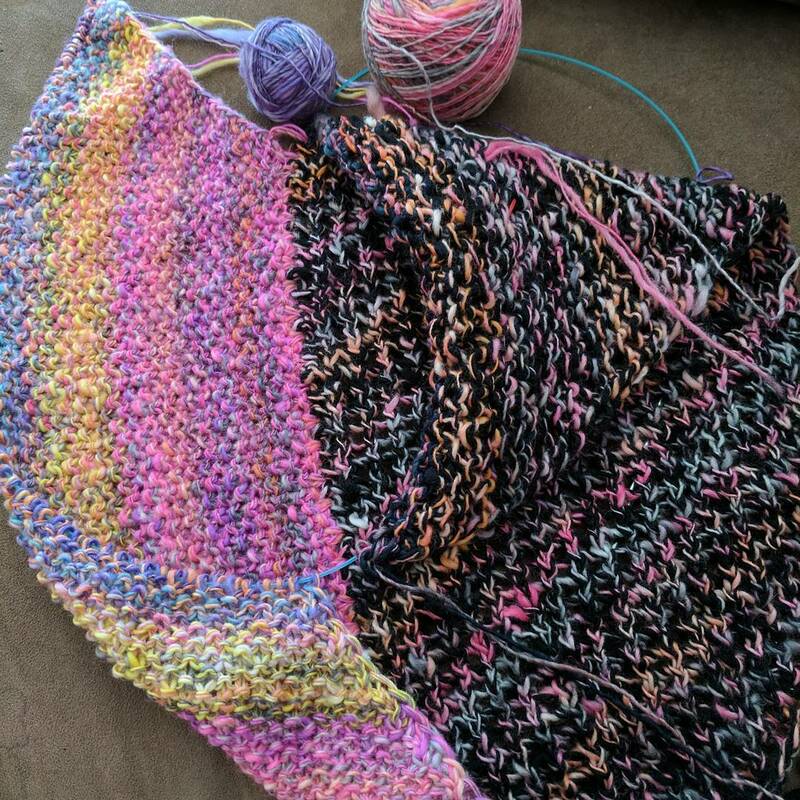 And yesterday, as soon as all my minis were weighed and measured, I dove into section 2 of the shawl. Sooo pink and fantastical! Tomorrow I'll share the maths I'm using to marl this section and maximally utilize my minis. This is the Yarn Lab after all, and how could I resist some knitting maths? Oh and as for the rest of the minis from this colour wheel? I have an idea for them already! Colour pops in a Squiggle Wiggle What?! but that's a homespun westknit project for a future date!